This Magnificence wool/cotton mattress is 31cms deep and has 2000 individual pocket springs. Pocket sprung mattresses feature springs that are individually wrapped in their own fabric pockets. Each spring reacts independently to the weight placed upon it meaning there is no more roll-together. There is much better support for the lighter parts of your body and less pressure on your hips and shoulders. It also ensures that any movement by one person in the bed should not disturb the other person in the bed. 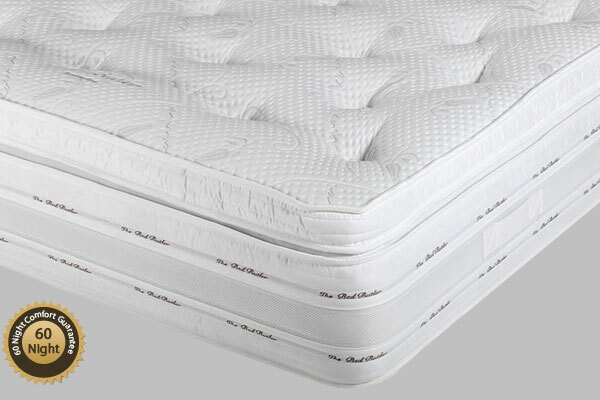 The mattress has a cotton and wool blend filling with a pillow top finish for perfect comfort. The cover is made from a premium viscose fabric and it has a 3D breathable branded border. The breathable border allows the mattress to keep cool in the summer and warm in the winter. It has handles built into the sides to aid in turning the mattress head to toe. This Magnificence wool/cotton mattress with its 2000 pocket springs will provide excellent support for those who have back problems and therefore need a firmer mattress. This mattress will give you all the comfort you need for a perfect night`s sleep.